Human body needs to maintain its core temperature at 37 ºC. In order to do so, it must constantly exchange heat with the surroundings. People feel comfortable when this process is sufficiently supported by the surrounding thermal environment of a building. Buildings are ultimately meant to shelter and provide comfortable habitats. Significant amounts of energy are expended when buildings are cooled or heated through mechanical equipment to maintain desired thermal comfort conditions. It is essential to understand what thermal comfort is and how it can be achieved with the least amount of energy spent to do so. Thermal comfort is an assessment of the thermal condition of the surroundings. ISO 7730 states defines thermal comfort as “That condition of mind that expresses satisfaction with the thermal environment”. People may feel that their surroundings are warm, cold or simply comfortable depending on the thermal state of the surroundings, and, equally importantly, physiological and psychological factors. Lack of comfort due to the last factors cannot be alleviated by cooling or heating a building, but thermal conditions can be changed for better. Which brings us to the next question – why do humans feel thermally comfortable or uncomfortable, in other words, warm or cold inside buildings? Human body is in a near continuous exchange of heat with the surroundings. Heat is produced inside the body due to biochemical processes like metabolism. It is also produced or lost due to conduction, radiation and convection when the body touches, or is in the vicinity of a heat source. 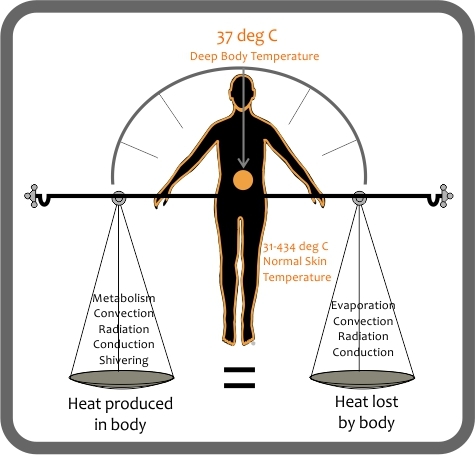 Deep body temperature must remain constant at 37 °C and to maintain this equilibrium the body must lose or gain heat to or from its surroundings. Table:Air temperature, humidity, air movement and radiant temperature impede or support heat exchange between humans and their thermal environment. Thermal comfort can be influenced by physiological factors like clothing, metabolic activity, age and gender, as these also determine the rate of heat exchange between the body and its surroundings. Wind Depending on its temperature, it can induce heat gain or loss in the body. Wind velocity and movement, within tolerable limits, can alleviate thermal comfort. Clothing Insulation between the human body and environment. Higher the insulation value of clothing, less will the heat exchange with surroundings. Activity Metabolism breaks down energy from food. Only 20% is used by the body and the balance has to be dissipated to surrounding environment. Age and gender Metabolic rate of older people, children and women are lower than men. People who are ill also have low metabolic rates. Methods to alleviate thermal comfort in warm climates are encouraging heat loss from body through ventilation, evaporation, convection and radiation. The adaptive thermal comfort model should be followed for naturally ventilated or hybrid ventilated buildings. While designing a building for enhanced energy conservation, determine the time period in a year when mechanical means of cooling or heating can be ignored to maintain thermal comfort in the spaces. This can be done either through using software tools like Climate Consultant or through simple calculations using the psychrometric chart. Make provision for Post Occupancy Evaluation (POE) in buildings. Post Occupancy Evaluation involves systematic evaluation of opinion about buildings in use, from the perspective of the people who use them. It assesses how well buildings match users’ needs, and identifies ways to improve building design, performance and fitness for purpose. A simple way of estimating the level of thermal in a space or environment is to assess the percentage of persons dissatisfied with the thermal environment is above a certain level. This information can be obtained through a series of simple questionnaire that assess thermal expectation and sensations. ASHRAE 55, Thermal Environmental Comfort Conditions for Human Occupancy. Requirements for building thermal conditions. A. Zhivov, USACE Engineer Research and Development Centre. The adaptive model of thermal comfort and energy conservation in the built environment. R. de Dear and Gail Schiller Brager, 2001. Earth and Environmental Science, International Journal of Biometeorology, Volume 45, Number 2, 100-108. Comfort, climate analysis and building design guidelines. Givoni B., 1991. Energy and Buildings, 18 (1992) 11-23. Developing an Adaptive Model of Thermal Comfort and Preference. de Dear, R. and Brager, G. S.,1998. Indoor Environment Quality. CBE Thermal Comfort Tool by University of California, Berkeley. Thermal Comfort Tool by ASHRAE. PsyCalc for indoor air quality simulation. Developed by Linric. Adopting the appropriate thermal comfort settings can yield significant energy and cost savings in buildings. The heating and cooling system sizes can be reduced by about 2% for every 1°C rise in the design setpoint. The operating energy is also directly proportional to the thermostat settings and comfort conditions. Using a ceiling fan and reducing high wall and roof surface temperatures can ensure thermal comfort even at higher air temperatures. Every 1°C increase in the indoor thermostat setpoint results in 2-3% reduction in cooling energy required.